In today’s tutorial, I’ll step through the entire install process in full unabridged detail. While it might seem a bit daunting to go through the Hackintosh setup process for the first time, once you understand the basics, it’s not so difficult. Have a look at our hands-on video for more details. I’ve personally built a working Hackintosh with all of the parts listed above, as I showcased in the previous post in this series. Be sure to read that post and watch the video for an explainer as to why I selected the hardware I did. Keep in mind that you don’t have to use the same hardware, but this step-by-step guide was made using these particular hardware components. 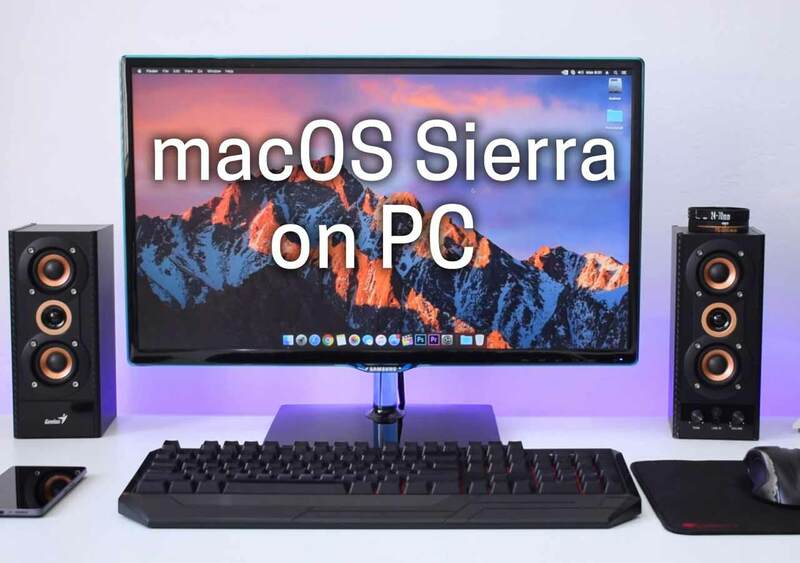 Although we have included a written walkthrough as a compliment to the video, I highly recommend watching the entire 16-minute install video if this is your first Hackintosh build. In this video, I walk through the entire process, including UEFI BIOS steps, all recorded using direct-feed methods. That makes for a high-quality tutorial from start to finish. The macOS Sierra Installer can be had free of charge from the Mac App Store, but you will need a Mac to download it. Once the download is completed, close the installer window that appears. Warning: Be sure that the flash drive is free of any files that you need. Connect your flash drive to a USB port on your Mac, and launch Disk Utility. Select your USB flash drive. Be careful to select the correct drive before proceeding, or else you risk formatting the wrong disk. Select your USB flash drive and click the Erase button at the top of the Disk Utility interface. Click the Erase button to proceed. Once the drive is formatted, click Done and close Disk Utility. Keep in mind that if you choose another name for the USB flash drive when performing the erase procedure in Step 2, you’ll need to modify the Terminal command to reflect those changes. It will take some time for the macOS Installer process to finish. Be patient and let the command run to completion. Extract the Clover EFI bootloader installer package and right click on the .pkg file and select Open. Select the Install macOS Sierra flash drive and click Continue. Ensure the following options are checked, and click Install. You’ll next be asked to enter your Mac’s password. After doing so, click Install Software. The install process is extremely brief. Once the install is completed, you should see the Installation Complete! screen. Click Close to exit the Clover EFI bootloader tool. Once the Clover EFI bootloader is successfully installed, the EFI partition should be mounted and available to browse in Finder. If, for some reason, the EFI partition isn’t mounted, or you need to remount the partition, you can do so using Step 13 below. In order to install macOS on your Hackintosh hardware successfully, you must add the FakeSMC.kext kernel extension to the EFI partition that is created and mounted upon completing the install of the Clover EFI bootloader in Step 5. You should also copy AppleIntelE1000e.kext for Ethernet support. This is not a required step, but I recommend saving the ‘Hackintosh Files’ folder (created in Step 4) to the Install macOS Sierra partition on the USB drive. By doing so, you keep the files in an easy-to-access place for future usage. All of the required files are now on the USB drive. Eject the drive from your Mac, and place the drive into one of the USB ports on your Hackintosh machine. Now that your USB drive is prepared with the macOS Installer, Clover bootloader, and supporting kexts, it’s time to install macOS on your Hackintosh machine. This is assuming that you’ve already built your Hackintosh and it has a drive, preferably an SSD, waiting to be used. But before we get to the installation, the first thing that you’ll need to do is to prepare the UEFI BIOS. Once inside, you can go through the UEFI BIOS configuration process to prepare for your Hackintosh installation. In this example, I’m going to use the GA-Z170X-Gaming 7 Motherboard that I used for my Hackintosh build. The first step is to navigate to the Save & Exit section, and select Load Optimized Defaults. Next, go to the Peripherals section, and enable XHCI handoff. Next, go to BIOS Features, and enable the UEFI USB drive as the first boot option. Lastly, go to Save & Exit, and save your changes and exit setup. The Clover Boot Manager will load next. Select the Boot OS X Install from Install macOS Sierra option and press the space bar to select boot options. Select the Verbose option using the space bar, and choose Boot macOS with selected options. You will see a lot of text appear on the screen since we selected Verbose mode. This allows us to see and troubleshoot any errors, if any, during the boot process. After selecting your language, the macOS Utilities window will appear. Select Disk Utility, and Erase the SSD or Hard Drive installed inside your Hackintosh. Give it a name like ‘Hackintosh HD’ for easy identification. Exit Disk Utility and select Install macOS and click Continue. Proceed through the initial macOS Sierra installer prompts. Select Hackintosh HD, or whatever you named your disk, and click Install. The Install process will take a while, so be patient. Eventually your machine will reboot. When the Clover Boot Manager appears again, select Boot macOS Install from Hackintosh HD, and press the space bar to select the Verbose boot option, and boot with the selected options. The macOS Sierra install process will continue, and after some time, your machine will reboot. Once the Clover Boot Manager appears, select Boot macOS from Hackintosh HD, and again, select Verbose mode and boot with the selected options. Work your way through the initial macOS setup process, which involves choosing your location, connecting to Wi-Fi, etc. Once you complete the setup, the macOS desktop will appear. So we don’t have to rely on the USB drive to boot into macOS, we’re going to install the Clover EFI bootloader on the internal ‘Hackintosh HD’ drive. Open the Install macOS Sierra USB drive via Finder, and navigate to the Hackintosh Files folder that you created in Step 4. Launch the Clover EFI bootloader again, and go through the same install process that we covered in Step 5. This time around, however, change the Install Location to the Hackintosh HD internal drive. Don’t forget to customize the install, and make sure the options you select match the screenshot below. Once the install is completed, the EFI partition on your internal Hackintosh HD drive should automatically be mounted. Navigate to/EFI/CLOVER/kexts/10.12 and move FakeSMC.kext and AppleIntelE1000e.kext (found in the Hackintosh Files folder) to that location. The install process for both the VoodooHDA audio drivers and the Nvidia Web Driver are extremely straightforward. Just open the packages, and proceed through the install of each. Once both are installed, reboot your machine. Press the delete key after rebooting to load the UEFI BIOS. Navigate to BIOS Features, and change the first boot option to the UEFI OS internal drive instead of the USB drive. This will force the system to invoke the bootloader stored on the internal drive so that it can work independently of the USB drive. Save the changes and exit the UEFI BIOS. Select the Options button in the Clover Boot Manager and navigate to SMBIOS. Return to the main Clover screen, select Boot macOS from Hackintosh HD, and press the space bar to choose boot options. For boot options, select both Verbose and Use Nvidia WEB drivers (nvda_drv=1). Once these are selected, choose Boot macOS with selected options. If everything is configured correctly, macOS Sierra should load with both sound and Nvidia graphics working properly. So that you don’t have to manually change boot options upon each reboot, we’re going to modify the Clover configuration to keep those options persistent upon each reboot. To do this, we will need to mount the EFI partition manually. This can be accomplished via Terminal. This command will provide a list of all of the drives on your system. Thereafter, you can easily identify the device and slice (partition) of the location you wish to mount and make it available to Finder. In this example, disk0 is where the EFI partition resides on the Hackintosh internal drive. The EFI partition is located on slice 1, so the name to target is disk0s1. Keep in mind that your disk and slice location for the EFI partition may differ. Be sure to utilize the diskutil list command to pinpoint its accurate location. Once the EFI partition is mounted successfully, you should see it in Finder. Open the EFI folder followed by the Clover folder. Open the Config.plist file with TextEdit, and search for the word boot. Add the key and string values highlighted in yellow. Save the Config.plist file, and exit out of the file. If you see a message about the lack of permanent version storage, just click OK. Step 15: Restart your Hackintosh! Since the Clover bootloader is installed on the internal drive, and the required configuration values were changed, you should no longer have to select boot options to boot correctly into macOS. If everything worked, macOS will boot normally when choosing Hackintosh HD from the Clover Boot Manager. For the most part, everything should work. Sound, Wi-Fi, AirDrop, App Store, GPU, Bluetooth, etc. As mentioned, it’s a Hackintosh, so not everything will work perfectly, but I find that this machine works well enough to be largely usable. Not just that, but it’s more powerful, quieter, and more expandable than many of Apple’s very own product solutions. How did you enjoy this guide? Please consider subscribing to our YouTube channel if you benefited from this walkthrough, and leave a thumbs up on the video as well.